Check out these great instructions for a beefy cat scratching post/cat tree. It’s a no-frills, utilitarian design, but it looks easy to build and that it will last forever. You can make it fancier by painting the shelf supports and by the color carpet you use to cover the shelves. And if you don’t cover the center post in sisal, you could paint it too. You will need a drill, a saw, and a good staple gun (I recommend an electric one to make sure you get the staples sunk deep.) 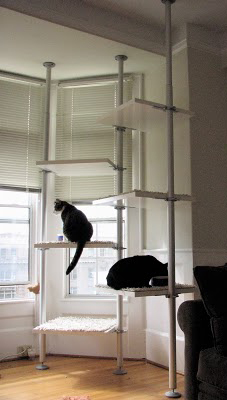 And be sure to stagger the shelves and make them large enough that your cat can actually climb the tree. Don’t miss these previous posts on a DIY cat tree and a DIY scratching post.